Take care of your personal beautification needs at Ginger Root Hair Salon in St.Charles, IL. Whether you are looking for hair styling, waxing, or makeup... Ginger Root can create that very special look. Our mission is to cater to your individual needs. We strive to combine our passion for hair with our vision for connecting beauty, environment, and well being. After a visit to Ginger Root Hair Salon you will feel renewed and uplifted from your experience. 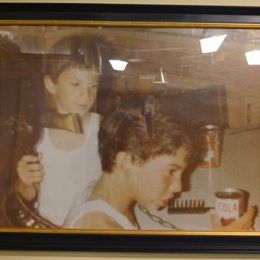 Inside Ginger Root Hair Salon a photograph of me at a young age blow drying my brother's hair hangs on the wall. I've been honing my craft ever since. With seven other hair dressers in the family, it was hard to escape my destiny. Ginger Root Hair Salon encapsulates everything I have learned since the first day I picked up that dryer. At Ginger Root, my wife Kirsten and I have hired and trained a talented and skilled staff. The services are all about hair, and range from simple blow dry service to permanent hair straightening and hair extensions. The atmosphere inside Ginger Root is one of comfort and friendliness. We put your needs and comforts first. We want people to have a pleasant experience and leave happy, wanting to come back. Here at Ginger Root we want you to feel like a star. That's why people go to a salon, to feel and look great. Upon visiting Ginger Root, clients are warmly welcomed with a beverage and a smile. With such a friendly and experienced staff one could only expect to have an exceptional visit. Our services offered are haircuts for men, women, and children, special occasion styles, a full range of color techniques, hair straightening, hair extensions, eyebrow, upper lip waxing and perming. We also offer a full range of hair and make up products.